I had the opportunity to help save an Echnida a few days ago. As I headed home from a spot of grocery shopping I noticed a lady on the side of the road with two quite large dogs. Instantly I could see that she was distressed, she was waving her arms around madly, whilst still trying to hold onto both of her dogs. For a moment I thought something was wrong with her until I realised she was strying to get the traffic to stop on her side of the road. I glanced down and saw a small waddling ball of ultra dark brown spines moving across the road. How could I not stop and help. He obviously came from the bush that you can see on the far side of the road. There's quite a large area of busland there, which is just a km or two from our home. Thankfully I had on my ultra thick soled shoes, I certainly wasn't touching the little guy and managed to prod him along and get him off the road. For a moment the woman that had stopped before me and I looked at each other, with that, "Now What?" look in our eyes. He was burrowing his little might out to try and get into the ground and boy do they have a grip when they want to. I was kinda on my own here, if the lady with the dogs let them go even for one second they were having that little echidna for lunch. Although I seriously think it would have been the dogs that would of came off second best. The only thing I had in my car was a picnic mat, it's not a rug, it is a large woven piece of recycled plastic, a great picnic mat, but not trusted to pick up a very spiny echidna that's for sure. I tried to prod him and move him onto the mat but he wasn't budging. In the end we chose to phone the vet, that was about 2 km away and they came to the rescue. He didn't go with out a fight though and it took them a good while to pry him away from his little spot on the ground. One quick smile for the camera (not a great photo I only had my phone). The vet assured us that they would call a local wildlife carer to have him checked out and looked after ready for release. I thought I'd include a nicer image just to show what the little guy did look like, except he was considerably darker. 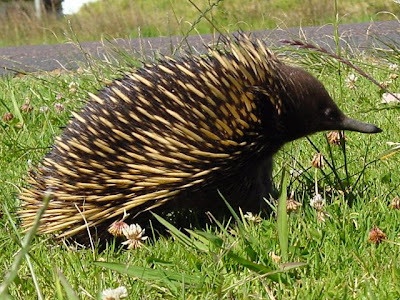 My last encounter with an echidna was on our honeymoon, in Maleny. My husband and I watched mesmerised as one waddled across the road in front of us. Thankfully Maleny is all bush so that one found his own way to safety quite quickly. The only disappointment, the one day I didn't have the kids with me. They were very upset about it. How cool to see him and help him out. They are cute. I bet the kids were so bummed to miss that! Oh what a shame the kids weren't with you. How amazing. I have only ever seen 1 echidna in the wild and that was at Capalaba Park of all places!!! They are soooo cute. yes a really great story. Joseph will be very impressed, we have a wildlife warrior in our midst. Thanks Kylie, I enjoyed reading this story to Noah!